One of the first things I did when I moved back to the states was get me some toms...because, well, all the cool kids had them. And it didn't take long for those amazingly comfortable shoes to stink oh-so-bad. And other than my super rad (and super honest) friend Karen, no one else would admit that their toms made their feet smell. I eventually wore out those toms and moved on. After living without toms for a while, I decided I wanted another pair in my life. When at the store buying them, the lady mentioned that toms are supposed to be worn with socks. Uh, what?! I then admitted to her that my last pair smelled not so good and she convinced me to get some socks to wear with them. Let me just say, these socks have changed my life! I can now wear toms AND not have stinky feet (and shoes). So for all of you stinky feeted tom-lovers out there, you are welcome. 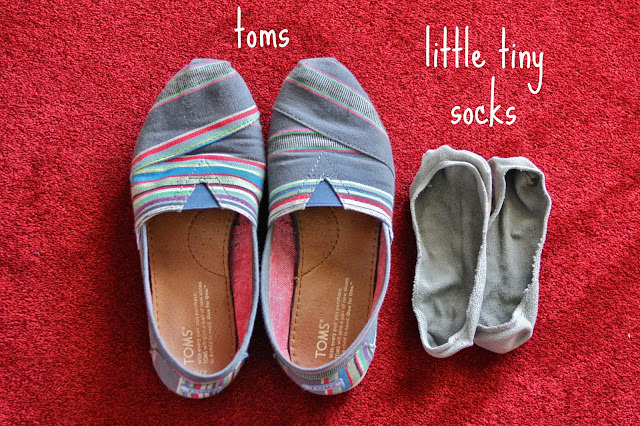 Go get you some little tiny socks for your toms and you will thank me...and so will anyone else that has to smell your feet after you wear your toms. And for all of you that don't have stinky feet from toms, whatever. I still don't believe you. I don't have tom's but those little socks have saved me with flats. best thing ever! I totally have this problem! But i can't find any tiny little socks that stay on my tiny little feet! They all seem to either slip off OR be too big so that they show outside the shoe. Where'd you find your tiny little socks?? I got them at Journeys. They have a little silicone area on your heal that pretty much keep them in place. Every once in a while, they will slip off, but in general they stay put. I just got Toms and wear them daily and haven't noticed stinky feet yet...but it's cold this time of year so maybe that's why I haven't noticed any stink. But if I do, I'll definitely get those little socks. Thanks for the suggestion! You should have asked me - I will freely admit that Toms smell! I really want Toms because of you and now I will never get a pair without getting these socks too!